"Small Horseshoe Earrings set with CZ's"
Just a little bling for the ring please! The Gorgeous Horse is your source for custom equestrian jewelry. Just a little bling for the ring please! 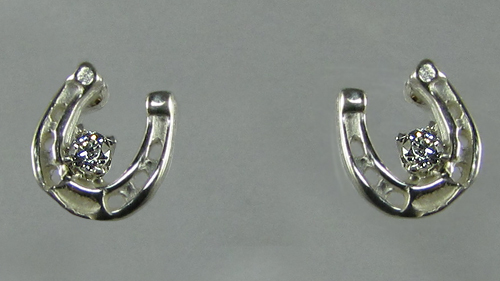 Check out these great little horseshoe earrings set with cubic zerconias. Light wieght and offering true lifelike style horseshoes and perfect for riding in. Dimensions: 1/4 inch x 1/4 inch. Use the request box below to customize your order. Have our skilled jewelers set whatever birthstone you like. Please note that prices may vary.